Michael Stammberger, Manager Apprenticeship (right) and Trainer Veronika Fuchs (left) with apprenticeship program graduates in Coburg. 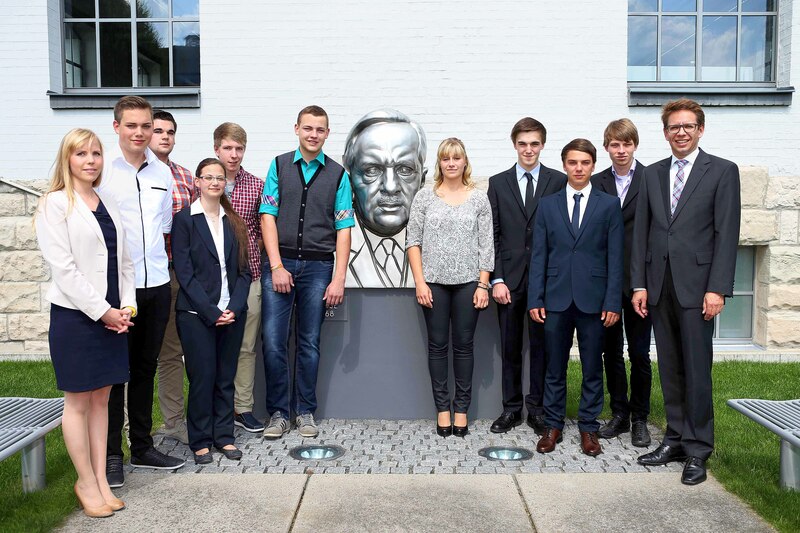 29 young men and women in Germany have successfully completed their training with international automotive supplier Brose. They will be working as industrial clerks, electronics, mechatronics and tool technicians at five different locations. 26 of the junior members of staff took advantage of the family-owned company’s offer to continue their employment. Three of the young specialists are continuing their education in order to study engineering later on. A total of 13 apprentices learned their trade at the Brose locations in Coburg and Hallstadt, nine in Würzburg, five in Wuppertal and two in Berlin. More than a third of this year’s program graduates completed their training with excellent exam results. Brose currently employs around 330 trainees in total, 99 of whom participate in a dual studies program at a university of applied science. 172 are receiving their education and training in Coburg, 26 in Hallstadt, 75 in Würzburg, 13 in Wuppertal and six in Berlin. Over 50 young adults are receiving training at eight international locations in the US, Brazil, England, the Czech Republic, France and Spain. More than 100 young men and women will begin their apprenticeships with the automotive supplier in Germany starting on September 1, 2014.